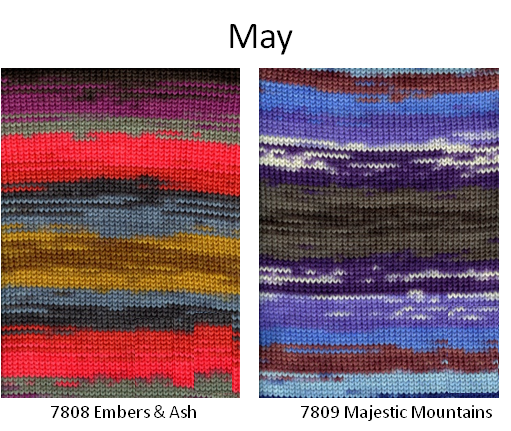 We love to see what independent designers can do with our yarns. I was recently trolling Ravelry looking for some gems, and came across some beautiful independent crochet designs. Enjoy! Kristen TenDyke is a huge proponent of crochet, with quite a few patterns under her belt. Her Flame Scallop Cardi is soft and vibrant in Fresco. 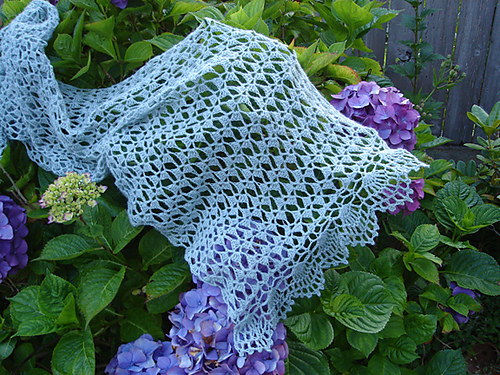 Wendy Lewis designed the Jane Austen shawl (Rav link) in Silky Alpaca Lace. I can certainly relate to her story about finding your favorite craft and letting it take over your life. Monica Brown's Cropped Cardigan is adorable and a free download in Premiere! I adore Laura Nelkin's designs. I love that this fun, flirty summer top has a sewing component. It should be easy to find a companion fabric for one of the 26 colors of Wool Bam Boo. Look at the beautiful edging on Lisa Gonzalez's Cut Away Cardi. Premiere is the star in this free pattern! 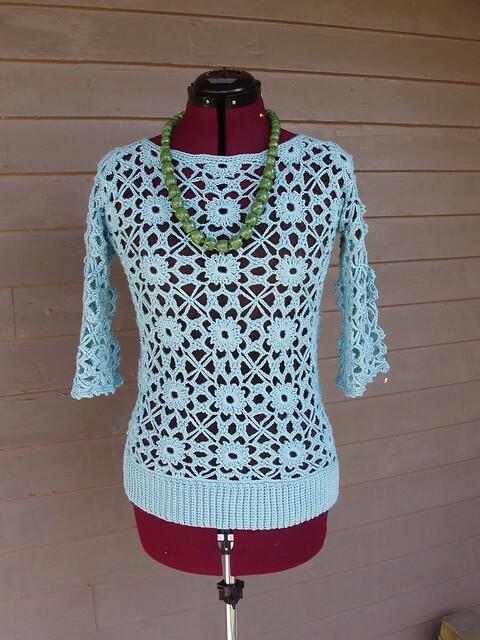 I love a dolman sleeve, especially when there's openwork involved. 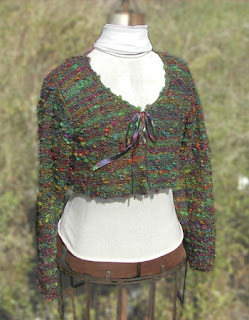 Robyn Chachula's Zany pullover (Rav link) has both those things in Wool Bam Boo! Here at Classic Elite, we are always trying to think of ways to support our local yarn shops. You may have seen our post on Classic Elite Knit-a-Longs, a fabulous way to get your customers excited about spring knitting. 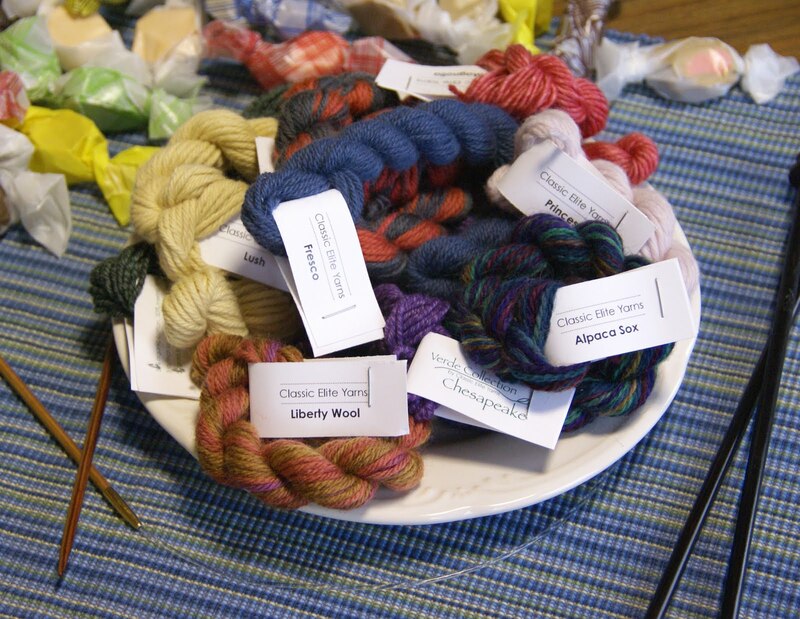 Yarn tastings are another way to bring crafters together in your shop and to have fun exploring new fibers! You might be wondering just what the heck a "yarn tasting" is. 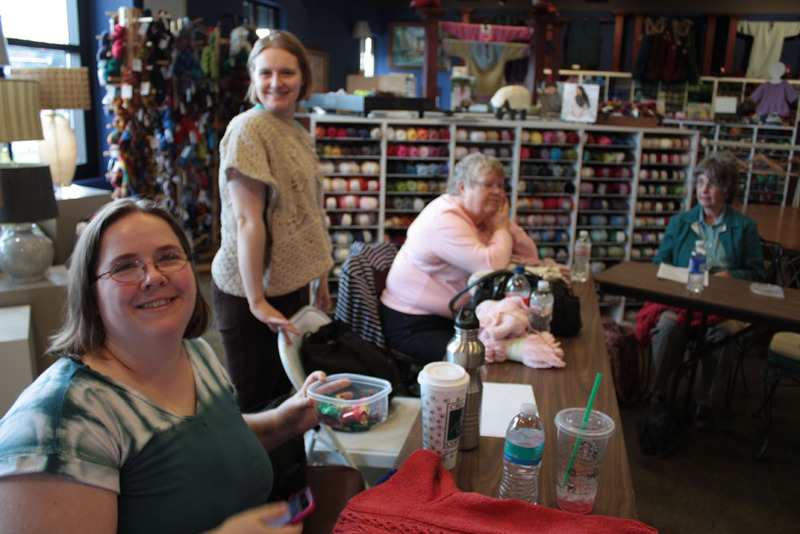 Its a crafting party where knitters and crocheters get together to try out new yarns together. You can feature either the Classic Elite yarns you already carry, or maybe a few you're considering carrying in your shop. When you order your kit from us, everything you need is included. All you have to do is schedule your party and let the world know about it! Mini skeins for any CEY brand name yarn (excluding luxury). You will receive 50 mini skeins (5 yarns each for 10 people). promotion/advertising template for your to customize with your store logo for an ad/flyer, plus pictures for blast emails, your store blog, etc. You might also be interested in hosting a Knit-a-Long. Click here for details! Share this post with your local shop using the buttons below. Tonia Barry is a prolific designer who has not only been published in many of the magazines and websites we read religiously, but has designed some of our most popular Spring 2011 pieces. We are also lucky enough to see her every day as a member of our in-house design team. You can see her self-published work at Tonia Barry Designs, or in the pages of Twist Collective, Knitscene, Creative Knitting, and Cast On, among others. 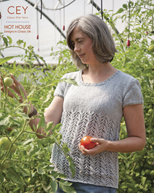 A quick Ravelry search revealed over 600 Tonia-Barry-designed projects! We recently chatted about her design process, how she got into this crazy business, and her work for the Classic Elite Spring Collection. I’d have to say Barbie was the first model to wear my designs. Barbie had some really stylish outfits fashioned by me. I grew up in a family of talented women who always got together (and still do) to knit and work on various crafty endeavors. I fell in love with knitting in the early 90’s and as soon as I started knitting, I started changing things on patterns and then designing my own pieces. But professionally, I’ve been designing since 2004. How did you get started? What's the first piece you ever designed? I started putting design proposals together and sending them out. My first published design was actually for CEY. It was a bolero in a yarn called Calliope. At this point, I started my own line, Tonia Barry Designs; my patterns are currently available online and in shops throughout New England. I also continued to do pieces for CEY and some of the knitting magazines. One day, I met an industry icon at a book signing and asked her if she would mentor me in trade for some knitting. She did not take me up on the knitting, but did spend her time teaching me how to put my portfolio together and how to fix some design issues I was having. Her help was invaluable to me. It was very much a “Pay it Forward” situation. She even bought some of my designs for her company. What pieces did you design in the Spring Collection? 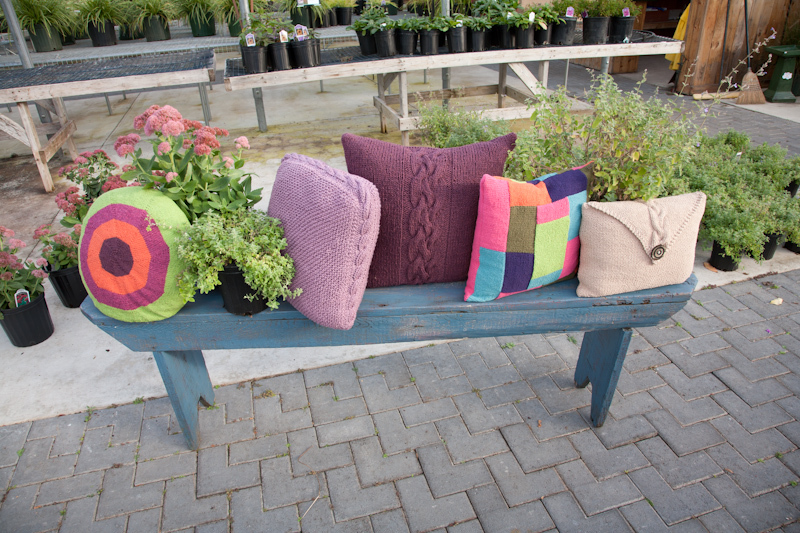 In High Seas- Parkhurst and Bailey; Garden Gate- Peony; Cricket- Shanda; Seedling-Sandpiper; Seaside- Nigh Duck; Rocky Coast-Landlubber; Shoreline-Vista; Wee Ones- Chloe; Home Sweet Home- Envelope, Center Cable, Patchwork and Stripe, Round pillows, Wine Bottle Bag. What is the timeline for one of your designs, from swatch to pattern to sample? I have some design ideas that have been lingering in one of my notebooks for years until some spark brings them to the forefront. Yet with others I will sketch it up, swatch it, and the pattern is off to a test knitter in a week or so. 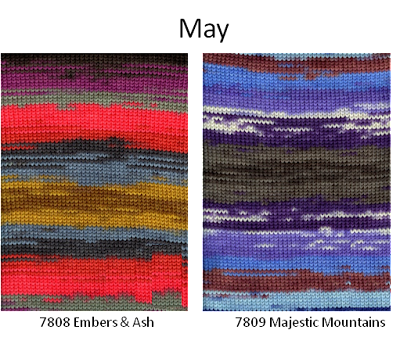 We started designing and swatching Spring 2011 back in February of 2010. Do you use test knitters? Yes, test knitters are as much a major component of a successful design and pattern as are technical editors. Test knitters work closely with me to work out any kinks in my initial pattern. I am fortunate to work with some very talented and conscientious test knitters. What is your "design process"? I normally start with a sketch, then play around with stitches in a swatch. The first thing I normally do when I’m ready to start writing the pattern is the schematic and then I go from there. Where do you do your design work? What does your "creative space" look like? Here at CEY, I design in my office. I have a mannequin to drape pieces on. I also have several baskets of yarn. I switch out the yarns based on the season that I am working on. Yarn is a great design inspiration for me. At home, in the winter I work in “my office”. Again, another dress form and bowls of yarn. But my favorite place to work is on my deck on a sunny summer day when the birds are chirping and the flowers blooming. What is your favorite piece you designed for the Spring Collection? What was your inspiration? My favorite piece for the Spring Collection is Parkhurst. It’s no secret that I love Silky Alpaca Lace. This yarn itself inspires me. I love playing with charts and lace stitches. In Parkhurst I wanted to create a shawl that was interesting but simple. I find that sometimes I need a little therapeutic mindless knitting, so therefore the stockinette stitch panel between the lace panel. I’m making one for myself as we speak, along with several members of my knit-night. Knit-a-Long With Us and Win! Spring Knit-a-Longs have been HUGE this year. Should your LYS be hosting one? Community is the lifeblood of the LYS. 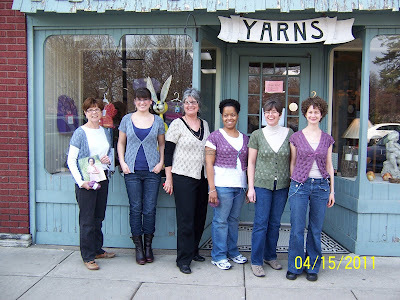 Yarn shops are where we meet new friends united by a common passion, learn, inspire, and share our lives with each other. There's nothing like walking into a yarn shop filled with happy knitters, chatting away and working on their projects together. Hosting events is an easy way to bring people together, and Classic Elite KAL's are a no-brainer. 1. To register your KAL, you must be a CEY retailer whose account is in good standing. 2. Assemble five or more participants and set a beginning and end date. 3. 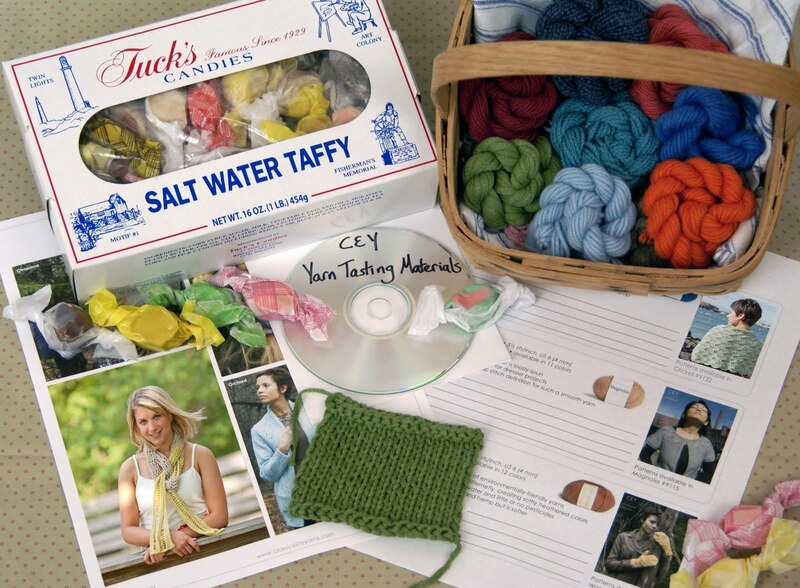 Have each participant choose any project from the 2011 Spring Collection requiring 2 or more balls of any CEY brand yarn. 4. Pre-register your group with Heather, our sales manager. 5. Sit back and knit, making sure everyone is done by your established end date. 6. Choose a winner to get the grand prize, a $100 retail value gift basket filled with sweet swag from our gracious friends at companies like ChiaoGoo, Soak, Della Q, Namaste, Eucalan, Lantern Moon, Designs by Romi, Paradise Buttons, and Buttons Etc. All our baskets are a little different, the picture below is an example of the great stuff you could receive. 7. Send us your pictures so we can share them with other Classic Elite knitters on Facebook, Twitter or Ravelry. The possibilities are endless, and there's no limit to the benefits. Hold a regularly scheduled knit group, or host your KAL online through Facebook or Ravelry. Choose a winner by raffle, whoever finishes first, or have your other customers vote on your own mini-trunk show. Hold a fashion show or other event where your knitters can showcase their latest garment. How will you participate in a Knit-a-Long this spring? May Liberty Print Colors and Patterns! Happy May! They say April showers bring May flowers; I can't wait to see my garden bloom over the next few weeks. With the new month comes new Liberty Print colors and new free patterns for our Liberty Print Subscribers. Embers & Ash is a combination of grays, blacks and reds with a brown and tan splash, while Majestic Mountains couldn't be a more appropriate name for a colorway that says it all in blues, purples and browns. 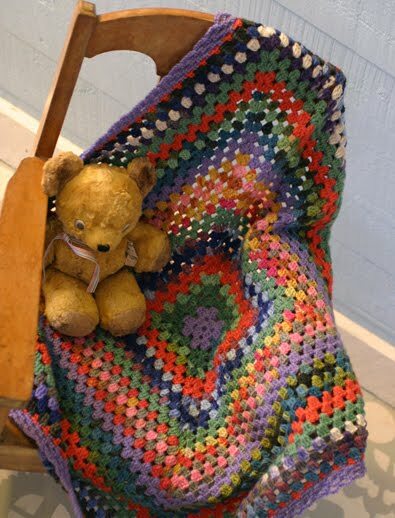 If you've made any of our free patterns, we encourage you to post your FO's on our Facebook wall! Using printed colors gives a wide range of colors without having to change colors and the solid stripes keep the overall appearance of the blanket from getting too muddy or chaotic. An easy-to-knit striped cap in super-soft, washable Liberty Wool. For distinct stripes, choose two printed colorways with no colors in common. Each hat will be unique depending on where in each color sequence the stripes meet. Note: For sizes S and M, 1 ball each will make 2 hats. 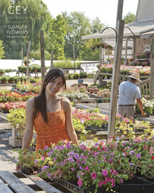 Jones Farm and Greenhouse was the site for our booklets Hot House, Summer Flowers, and Perennials (get it?). I love how the covers echo the titles. Hot House features five designs in Classic Silk, a silk/cotton blend with a nubby texture and subtle sheen. Summer Flowers has five designs in Katydid, our 100% organic cotton and GOTS certified ribbon yarn. Lastly, Perennials is a booklet of designs in Soft Linen, a "perennial" favorite here at Classic Elite. As Susan, our Creative Director, once said, "If I were stuck on a desert island and had to choose only one yarn to have with me, Soft Linen would be the one.". Take a look through these booklets below, and Happy Spring! If the Jones Farm flipbook does not appear below, click here to view it in a new window. This is the last in a series of blog posts featuring our Spring 2011 booklets. For the rest, click below!